Anchor Bolts (also called shield anchors) and Sleeve Anchors are through fixings that allow structures or items to be secured to a robust surface (brick, concrete, masonry, etc). The different types of security anchor products offered here work in a variety of ways to provide a reliable security fixing. Anchor Bolts and Sleeve Anchors are through fixings that allow structures or items to be secured to a robust base such as a brick wall or concrete base for example. Both the Sleeve Anchors and Anchor Bolts are expansion type fixings, however neither are intended for use in "heavy duty structural applications"
Sleeve Anchors feature an outer expansion sleeve, and are available with a threaded core, in the form of threaded rod type studding or a security bolt. Where the central core is studding, the sleeve anchors are available with either a Kinmar Permafix "One-way" Security Nut or a Kinmar "Two-way" Removable Security Nut. Where the central core is of the bolt type, it is of the Security Torx Type, with a choice of Countersunk or Button Head. These fasteners are often used as frame fixings, or for securing structures such as Smoking Shelters, Bike Racks, Signage or Street Furniture, to concrete, brickwork or masonry. Anchor Bolts offer a more robust fixing than the Sleeve Anchor and feature a heavier duty outer expansion sleeve. The central core is of the button head bolt type, with a choice of a Security Hex or Drill-Out Head. 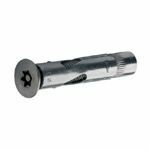 The Security Hex Anchor Bolt is a "Two-way" fixing, which requires a special Security Driver Tool (which must be ordered separately) to install or remove. The Drill-Out Anchor Bolt is a "One-way" fixing which is designed to be permanent. It is installed using a standard Hex Allen Key (not supplied with the bolt), but once fully tightened, the Drive Socket in the head of the bolt must be drilled out, leaving no way to undo the bolt again. 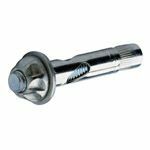 These fasteners are often used for securing security ground anchors to concrete bases for use as a security anchor point for chaining motorcycles or other valuable equipment to. They are also used for many of the same types of application that The Drill-out type provides a popular solution for installing security window grilles, etc.